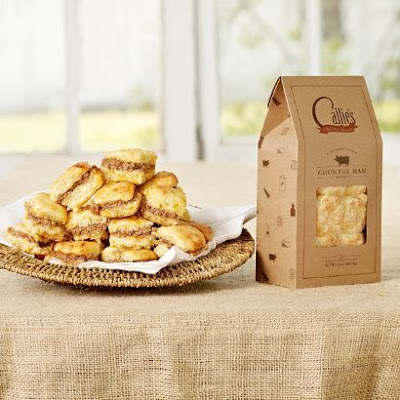 Fancy Food Show Spotlight on: Callie's Charleston Biscuits! September is National Biscuit Month! So here's a flashback to one of my favorite biscuits of all time- Callie's!! I will probably be talking about The Fancy Food Show until next year, but I can't help sharing some of the amazing foods and brands I sampled there. One of my many favorites was Callie's Charleston Biscuits. If you're looking for something new to serve at a cocktail party or even at a family dinner or brunch, you must check them out! The best part is their wholesome ingredients. It's like you're eating something homemade! When I came upon Callie's Charleston Biscuits at The Fancy Food Show in June, the show was just about ending for the day. My stomach was totally full and I wasn't sure if I could eat another bite. But then this heavenly aroma wafted past me, and I had to try Callie's country ham biscuits that had just come out of their mini oven. They were amazing. For a minute I didn't understand the concept- was this a mix? Were they a store? Why did they taste like they were straight from a bakery? What I learned was that Callie's Charleston Biscuits are fully cooked and frozen, so when you are ready to use them, you just pop them in the oven. They're great for cocktail parties, hors d'oeuvres, or even with breakfast. I was amazed by how buttery and southern they tasted! 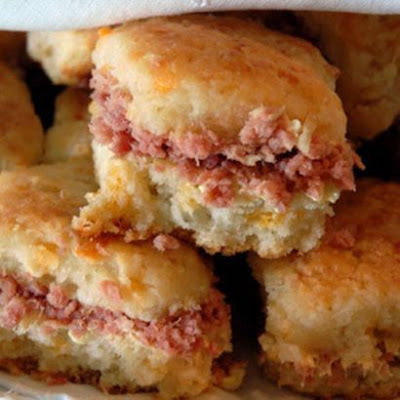 Callie's biscuits come in a variety of flavors, from buttermilk to black pepper to country ham. There's even a cinnamon version! I was also happy to find them in the frozen food section of both my local Kings and Fresh Market. If you can't find them in your local supermarket, you can order them right from the Callie's site. I'm already planning to serve them with Thanksgiving dinner, because I think they're that good. Since The Fancy Food Show was closing up shop for the day, I didn't get to sample too many of Callie's other products. But they were kind enough to send me a variety of samples to try. Look at the pretty package that arrived all tied with a yellow bow! Inside were a few items that I have to share with you. The first is Callie's Cocoa and Cream cookies. These were a SOFI nominee at the show, and they were heavenly. Much like the biscuits, they are made fresh and then frozen, so that you can just take them out when you want to serve them. They come in a cute little blue package, and they're large enough to share (although you might not want to). So much better than serving plain old cookies at a party, right? How to describe them? They're not at all like a regular chocolate sandwich cookie (you know the one I mean). I would say they are similar to a whoopie pie, but the cookie part is almost like a wafer consistency. Have you ever had a pie with a chocolate cookie crust? Well, it's kind of like that- not overly sweet, with a soft, creamy center that is hard to resist. I set aside three of these cookies for a photo and Mr. Jersey Momma stole one before I could even take the picture! He said he thought they looked like an ice cream sandwich, but they tasted much better. You can find these in your local supermarket or order them from Callie's online site, too! Another awesome treat that the fine folks at Callie's shared with me was their cheese crisps. These are part of their shelf stable line (they're not frozen) and remind me of a homemade cheese cracker. They had a bit of a bite to them and were especially yummy with a glass of white wine! I was also really excited to make my own biscuits, thanks to the mix that was included in my sample package. I'll be honest, biscuit making is not my forte! I made such a stinkin' mess! There was biscuit mix everywhere, even down the front of my pants (how did that happen?). I didn't even have a biscuit cutter! But the instructions included with Callie's Biscuit Mix were pretty straight-forward (I just needed to add butter, buttermilk and cream cheese), and even though I was the furthest thing from a good southern biscuit maker, I actually managed okay. See? And the end results, even though not as pretty as Callie's biscuits, were definitely delicious. Even The Jersey Momma's Boy ate them (and we all know he holds the title of World's Pickiest Eater). I was proud of myself! And I was happy to not be eating dough that popped out of a can or dough that was mass produced in a factory with lots of preservatives and chemicals. Carrie Morey is the owner and founder of Callie's Biscuits. You can read all about her and her mission here. Her products can be found throughout the United States or in her online shop. 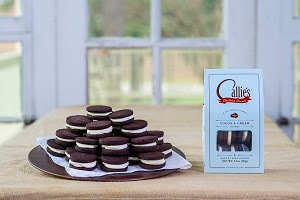 Callie's makes so many yummy products (which make great gifts, in my opinion), so be sure to check out their selection. If you happen to be visiting Charleston, South Carolina or Atlanta, Georgia, you can also visit Callie's Hot Little Biscuit Shop, and grab yourself something yummy to eat there! And if you still enjoy reading cookbooks like I do, then also check out Callie's Biscuits and Southern Traditions Heirloom Recipes Cookbook. There are some amazing recipes in this book (not just biscuits- there are desserts and snacks and a little bit of everything!). You can order the book through my Amazon affiliate link below! Disclaimer: I received free samples from Callie's Charleston Biscuits but that in no way influenced my opinion in this post. I don't lie about good food, people! Yum! Those biscuits look amazing. And those cookies?!?! I want some right now. I'm going to use the store locator to see if I can find them near me. Thank you! The cookies are the BEST!! You'll love them. Thanks, Shann! Omg so yummy!!! I'm a total carb lover so I need these biscuits in my life!!!!! Yes you do!! And don't forget the butter! Thanks for stopping by, CourtneyLynne!